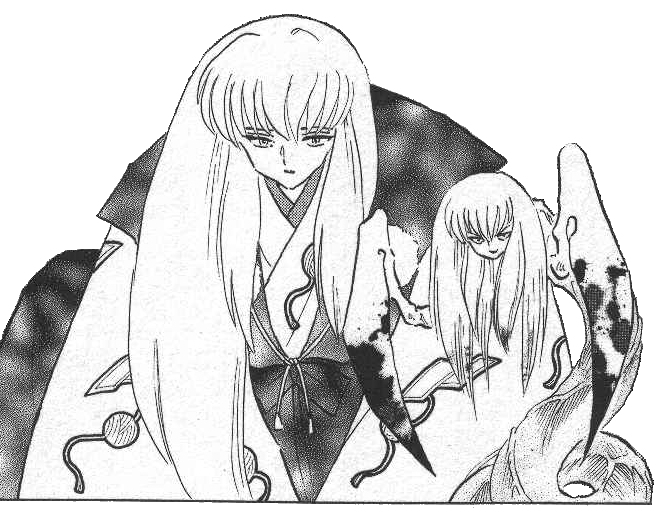 Naraku's fourth and fifth incarnations are the insidious duo of Juromaru and Kageromaru. Even Naraku has great difficulty controlling this pair, and when they are first born they slice off his head and devour two of his palace guards. Naraku keeps Juromaru in manacles and his mouth covered most times, and like Kagura, he keeps a tight grip on the pairs hearts in order to ensure their obiedience. The mask covering Juromaru's mouth ensures that his sibling, Kageromaru does not escape. Kageromaru is a small, snake-like demon that lives within Juromaru's stomach and is the sentient member of the pair, while Juromaru is an emotionless killing machine. Koga comes across Juromaru in the forest lead by one of Naraku's puppets. Naraku frees him to fight Koga, but does not take off the chains and mouth cover until Inuyasha arrives. As soon as the puppet removes Juromaru's gag its head is sliced off and Juromaru begins to fights with a blinding speed that is almost too fast to see. Koga and Inuyasha quickly realize that they are fighting a pair of creatures, rather than the single entity they initially battled against. Because Kageromaru spends most of his time living within Juromaru's stomach, he is able to quickly burrow deep into the earth, a skill he uses to launch blindingly swift attacks. Juromaru on the other hand relies on brute strength to win his battles. "Juromaru" means "beast or brute" while "Kage" means "shadow or phantom". The "ro" part is "sons" while "maru" is a common male name suffix. Takumi Yamazaki provides the voices behind this evil duo. 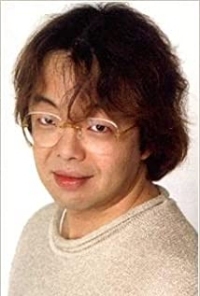 His most noted role is Isamu Dyson in Macross Plus. His other roles include George Do. Sand in G Gundam, Ferio in Magic Knights Rayearth, and Hans Klife in AD Police. He was also Copycat Ken in Ranma ½.
Brian Drummond is also known for his evil characters, most notably Vegeta in Dragon Ball Z. Brian's other roles include the Allen Schezar in The Vision of Escaflowne, Zechs Merquise in Mobile Suit Gundam Wing, Flanagan Boon in Mobile Suit Gundam, Hikaru Tsurugi in Key the Metal Idol, and the Crepe King in Ranma ½. Brian later returns to Inuyasha in the role of Renkotsu.